This symposium will follow from the previous international events organised as part of the programme “Measurement policies in a knowledge society” launched by the national research agency (ANR) in partnership with the ENS, the grande école in humanities. A first symposium addressed the transformations of the state and the forms of justice following the crisis of school democratisation. 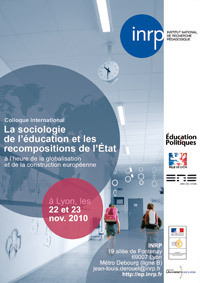 It was argued that the shift from “equal opportunities” to “equity” not only challenged the French welfare state model and its assessment instruments but also invited us to set these evolutions within a larger framework – the globalisation of educational systems and European construction. The second symposium open to Anglo-Saxon countries was the opportunity for a comparison of accountability-based educational reforms and for suggestions towards the modernisation of the French school model. This third symposium seeks to go deeper into the transformations of the regulating state in times of globalisation and European construction and determine the necessary changes for the sociology of education to take account of these transformations. By opening the “black box” of academic education (Derouet, 1992), the sociology of education gained legitimacy as government science and expertise provider towards decision-making in as varied fields as decentralisation, the functioning of schools, guidance, assessment, curriculum, academic failure, teacher work, management’s skills, and the socialisation of students (Derouet, Van Zanten, 2000). It has also contributed to designing new tools to measure inequalities and substituted more targeted investigations into the factors behind academic success for large-scale statistical surveys (Duru-Bellat, 2002; Millet & Thin, 2005, Ben-Ayed, 2009). This new sociology has focused on local issues and how stakeholders interact and mobilize at classroom, school and local levels. Despite this heuristic approach, the French sociology of education has remained impervious to scale changes imposed by globalisation and the European construction of education and research (Lauder and alii, 2006; Lawn & Novoa, 2005; Bruno, 2008). While French sociologists now fuel public debate on the relevance of international comparisons or on the challenges of the democratization of elites, they are still marked by Durkheimian tradition and Pierre Bourdieu’s legacy, whether they praise their virtues or expose their assumptions (Lahire, 1999; Baudelot & Establet, 2009; Dutercq, 2008). Although French sociology cannot be reduced to a state sociology, the French sociology of education seems relatively trapped in its methodological nationalism both in the design of its theoretical tools and ways of thinking (Poupeau, 2003; Meuret, 2007; Dubet, 2002). The symposium aims to investigate this theoretical and methodological positioning, with an emphasis on the changes that have affected the field of education at international scale for some fifteen years. This is also the opportunity to assess twenty years of French sociological works and compare them to methods of analysis designed in other countries. The event will put in perspective the relationships between sociological theory and the State in its most recent transformations in terms of justice and government knowledge in education or in other fields of public action (Derouet & Derouet-Besson, 2009; Bezès, 2009; Pierru, 2007). The contribution of the sociologists of education to appreciating and renewing issues of social criticism (Boltanski, 2009) will be addressed. The place of sociology among other academic knowledge production, the competition between sociology and other forms of expertise and its degree of legitimacy in the policy and decision-making environment at national and international level will be examined (Calon and alii, 2001; Dumoulin and alii, 2005; lhl, 2006; Robert, 2008; Georgakakis and Lassale, 2007). The symposium will also focus on the methodologies and comparative works that put some path dependencies into perspective or specify their singularirty (Dale, 1999; Maroy, 2006; Ball, 2008). Light will be thrown on the periods of mutual borrowing and of knowledge or instrument circulation from one space to another (Phillips, Ocks, 2003, 2004). The new approaches to the design of data, their comparability and totalisation will be compared to normative models borne by major international organisations (Osborn and alii, 2003). The symposium will also be the opportunity for interactions between the sociology of education and political sciences. The impact of globalisation on the existing frameworks of analysis; major changes affecting national educational systems; the building of international networks of researchers, experts, and policymakers; the transnational circulation and dissemination of cultural, social, and political models; the alignment of educational policies with accountability principles; the way the sociology of education accounts for it in a comprehensive and critical perspective. The European construction of education and its relation to the lifelong learning policy. How does the sociology of education tackle the deschooling of educational challenges? What is the right sociological framework to account for lifelong learning processes? How do sociologists shed light on the foundations and developments of the school modernisation project supported by European institutions? The place of the sociology of education in a post welfare environment and its contribution to a renewed ideal of justice. Sociologists now focus on the recognition of differences after inquiring into the issue of inequalities. How do their analyses align with the emergence of a post welfare state? How does sociology rethink the project of equal opportunities and the integration of educational services into social inclusion policies, New Public Management, the merchandisation and privatisation of state education? Who are the new stakeholders and partners of the state? What are their claims and how do they take social and political action? Ball S., (2008). The Education Debate. Bristol : The Policy Press. Baudelot C., Establet E. (2009) L’élitisme républicain. L’école française à l’heure des comparaisons internationales. Paris : Seuil. Ben-Ayed C. (2009) Le nouvel ordre éducatif local. Mixité, disparités, luttes locales. Paris : PUF. Bezès P., (2009), Réinventer l’État. Les réformes de l’administration française. Paris : PUF. Boltanski L., (2010), De la critique. Précis de sociologie de l’émancipation. Paris : Gallimard. Bruno I., (2008) À vos marques®, prêts… cherchez ! : la stratégie européenne de Lisbonne, vers un marché de la recherche, Bellecombe-en-Bauges, Éd. du Croquant. Callon, M., Lascoumes, P. & Barthe, Y. (2001). Agir dans un monde incertain : essai sur la démocratie technique. Paris : Seuil. Dale R., (1999) Specifying globalizing effects on a national policy in Journal of Education Policy, 14, 1, pp. 1-17. Dumoulin L., Labranche S., Robert C., Warin P., (2005), Le recours aux experts. Raisons et usages politiques. Grenoble : Presses Universitaires de Grenoble. Derouet J-L., (1992). École et justice. De l’égalité des chances aux compromis locaux ? Paris : Métailié. Derouet J.-L., (2003). (dir.). Le collège unique en questions. Paris : PUF. Derouet, J-L. & Derouet-Besson M.-C. (2009). Repenser la justice dans l’éducation et la formation. Berne : Peter Lang/INRP. Dubet, F. (2002). Le déclin de l'institution. Paris : Seuil. Dutercq Y. (2008) coord. Former des élites dans un monde incertain, Education & Sociétés n° 21. Duru-Bellat, M. (2002). Les inégalités sociales à l'école. Genèse et mythes. Paris : PUF. Georgakakis Didier et de Lasalle Marine (2007) La “nouvelle gouvernance européenne”. Genèses et usages politiques d’un livre blanc, Strasbourg, Presses Universitaires de Strasbourg. Ihl O., Kaluszynski M., Pollet G., (dir.) (2003) Les sciences de gouvernement. Paris : Economica. Lahire B., (dir.) (1999) Le travail sociologique de Pierre Bourdieu : dettes et critiques, Éd. la Découverte. Lauder H., Brown P., Dillabough J.A., Halsey A.H., (eds.) (2006) Education, globalization and social change. Oxford : Oxford TextBooks. Lawn M., Novoa A., (2005) L’Europe réinventée. Regards critiques sur l’espace européen de l’éducation, Paris : L’Harmattan. Maroy C., (2006) École, régulation et marché : une comparaison de six espaces scolaires locaux en Europe, Paris : PUF. Meuret D., (2007). Gouverner l'école : une comparaison France/États-Unis. Paris : PUF. Millet, M. & Thin D. (2005). Ruptures scolaires : l'école à l'épreuve de la question sociale. Paris : PUF. Osborn, M., Broadfoot, P., McNess, E., Ravn, R., Planel, C. & Triggs, P. with Cousin, O. & Winther-Jensen T. (2003). A World a difference ? Comparing Learners across Europe. Buchingham : Open University Press/McGraw-Hill Education. Phillips D., Ochs K., (2004), Researching policy borrowing : some methodological challenges in comparative education in British Educational Research Journal, 30,6, pp. 773-784. Poupeau F. (2003) Une sociologie d'État : l'école et ses experts en France, Raisons d'agir éditions. Robert Cécile (2008), “Expertise et action publique” in Borraz Olivier et Guiraudon Virginie (dir.) Politiques publiques. 1. La France dans la gouvernance européenne, Paris, Presses de Sciences-Po. Van Zanten, A. (2000). L’école : l’état des savoirs. Paris : La Découverte. Post welfare-state social inclusion: a new model of justice? The transformations of public health government: towards new solidarity? Is lifelong learning the new pillar of European welfare measures ? The measurement of inequalities in education through the perspective of higher education: global challenges, local actors?